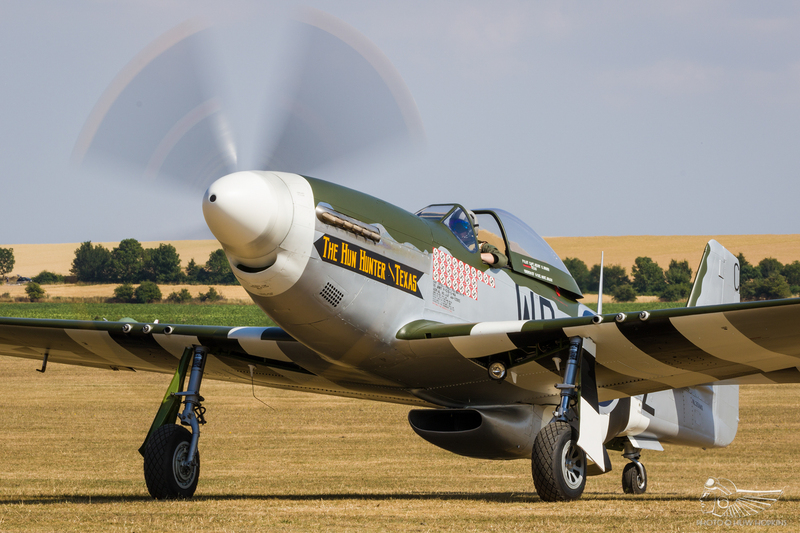 Flying Legends 2018 was the best edition of the 25-year old event in recent years. 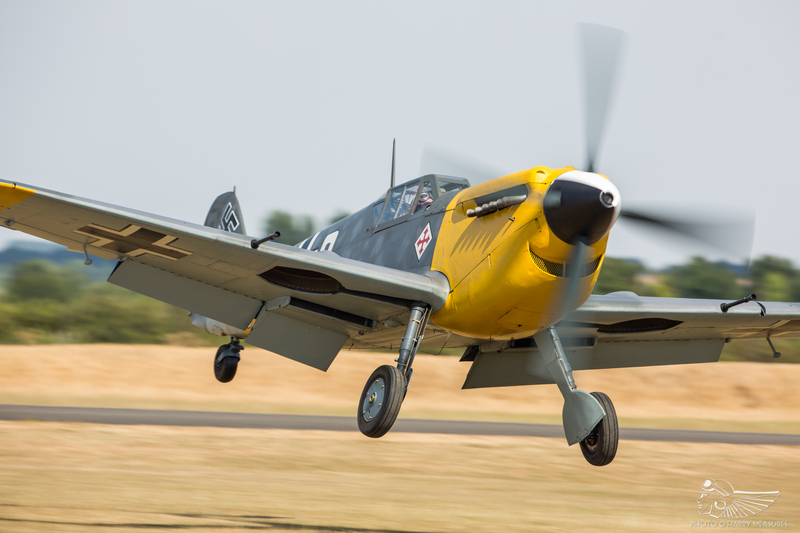 Headed by two post-restoration debuts and a further three UK airshow debuts, FL2018 fielded a strong flying programme that illustrated the breadth and depth of Europe’s historic aviation scene. The quality extended beyond the aerial displays – on the ground the Historic Aircraft Collection’s DH-9 E-8894 dominated the ‘Vintage Village’ on the hangar base at crowd centre, whilst organisers The Fighter Collection pulled off the surprise first public appearance of its Fiat CR.42 Falco after extensive restoration off-site from 2012 to mid-2018. It now wears the markings of 85-16, 85 Squadriglia, 18 Gruppo, 56 Stormo, which force landed near Corton Railway station, Lowestoft on 11 November 1940. Whilst there is much still to do to complete this monumental restoration, the Falco’s static appearance whet the appetite for what we all hope will become a future ‘Legends star. 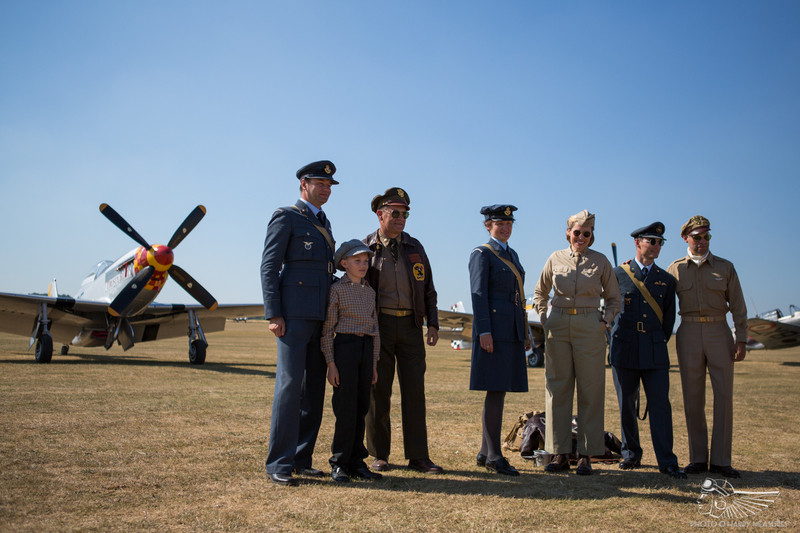 As ever, the atmosphere at Flying Legends was like no other – Duxford plays host to a remarkable collective of aviation personalities and aficionados over one weekend in July. 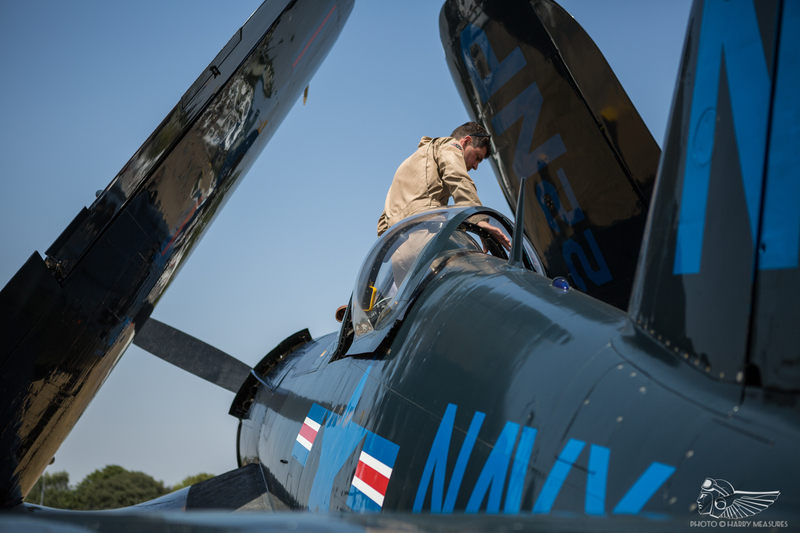 They come from all corners of the globe – restorers, pilots, veterans, enthusiasts and engineers alike, the shared love of aviation is infectious and courses through Flying Legends’ veins. You can’t walk ten yards without bumping into someone you know – be it somebody who has, through aviation, become a close lifelong friend, or an acquaintance you share a few brief moments with each July. As is now tradition at Flying Legends, the ‘Spitfire overture’ commenced the three and a half hour flying programme in terrific style with 12 examples of the type, from Mk.V to Mk.XVIII, getting airborne for a series of formation passes before splitting into the renowned Duxford multi-axis tail chase. Notable amongst these was PRXI PL893, recently restored to flight by Historic Flying at Duxford following a fatal accident in 2001. 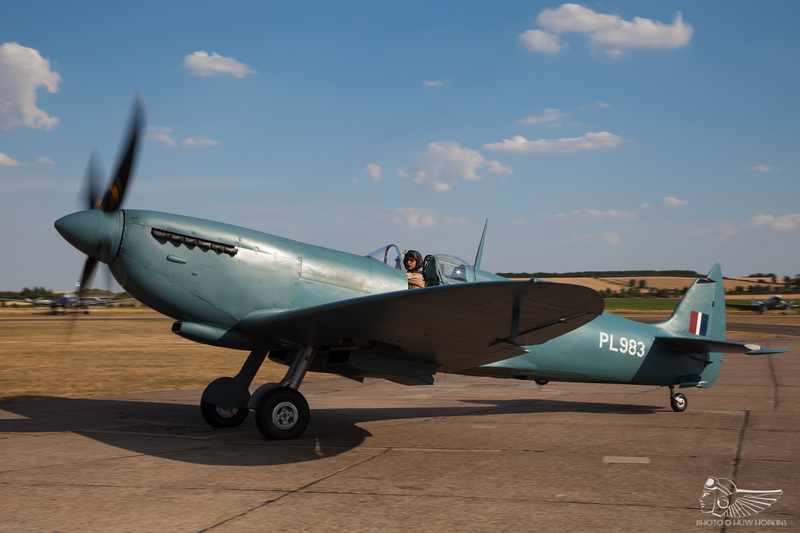 Now painted in attractive photo reconnaissance blue, the aeroplane flew again spring 2018 and was making its first post-restoration air display appearance at Flying Legends in the hands of Aircraft Restoration Company (ARCo) boss John Romain. Three of the four aeroplanes flying closer passes over the grass runway were flown by pilots participating in their first Flying Legends. Piloting ARCo and Air Leasing’s two-seat Spitfires were Martin Overall, Gabriel Barton (Saturday) and Phil Ansell (Sunday), whilst Jon Gowdy flew Anglia Aircraft Restorations’ gorgeous Mk.Vc EE602 Mabel – after its restoration was completed by the Biggin Hill Heritage Hangar, the aircraft was sold to its current owner earlier this year and what was once one of the more elusive Spitfires in the country is now enjoying a raft of air display appearances. Leading them was longstanding ARCo display pilot Dave Ratcliffe. Another pilot joining the ranks for his first ‘Legends was Andy Durston. Displays in aircraft operated by TFC and Anglia Aircraft Restorations have given him the opportunity to fly the likes of the Curtiss Hawk 75 and Grumman Wildcat, and here Andy was number three in the Curtiss Hawks sequence, flying TFC’s P-40F. 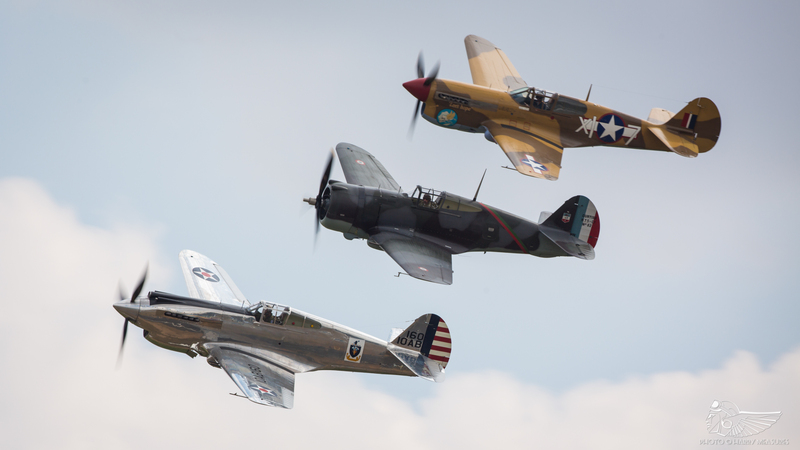 With Patrice Marchasson leading in the bare metal P-40C and Steve Hinton, Jr eeking every inch of power out of the Hawk 75 for a lengthy aerobatic tail chase of sweeping vertical figures and rolls, this was the finest Hawks display for several years. Returning to ‘Legends after a 16-year hiatus was Les Casques de Cuir’s F4U-5N Corsair, brought to Duxford from its La Ferté-Alais home by Baptiste Salis. This aircraft is a combat veteran, having been manufactured in 1951 and assigned to VC-3 with whom it flew from the carriers USS Valley Forge and USS Boxer. In 1956 the Corsair was delivered to Honduras where it partook in the “Soccer War” with El Salvador. It was eventually sold into private ownership and ended up with the Salis family in France. 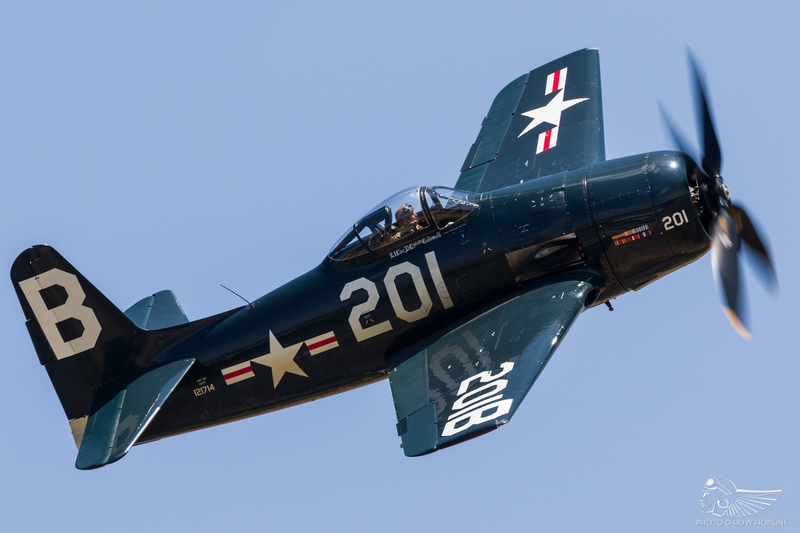 The Corsair has just emerged from an 11-year restoration, wearing a new VC-3 night fighter guise. Baptiste was notably the first of the prestigious Salis family to fly at ‘Legends, flying alongside TFC’s Corsair (flown by Alan Wade) for a duo tail chase comprising aerobatic figures and figure-eight passes. Pete Kynsey also gave a finnessed account of TFC’s Grumman Bearcat, demonstrating the diminutive fighter’s exceptional performance with such figures as a 16-point hesitation roll, a vertical 360 degree aileron roll and a penetrating loop with a roll at the apex. Since Stephen Grey’s retirement in 2013, PK has really made the Bearcat his own – his is an instantly recognisable display profile that is amongst the very best you’ll see at an airshow. Continuing the naval theme were Nick Grey and Richard Grace in TFC and Anglia Aircraft Restorations’ Hawker Furies. 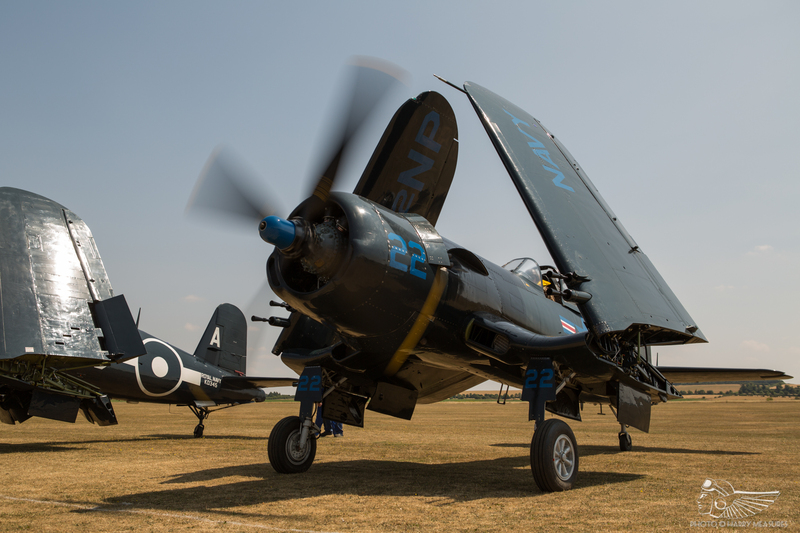 There’s a long lineage of ‘ultimate big pistons’ displays at Flying Legends, dating back to the mid-’90s when Messrs Hanna and Grey tore the sky apart in the Fury and Bearcat. 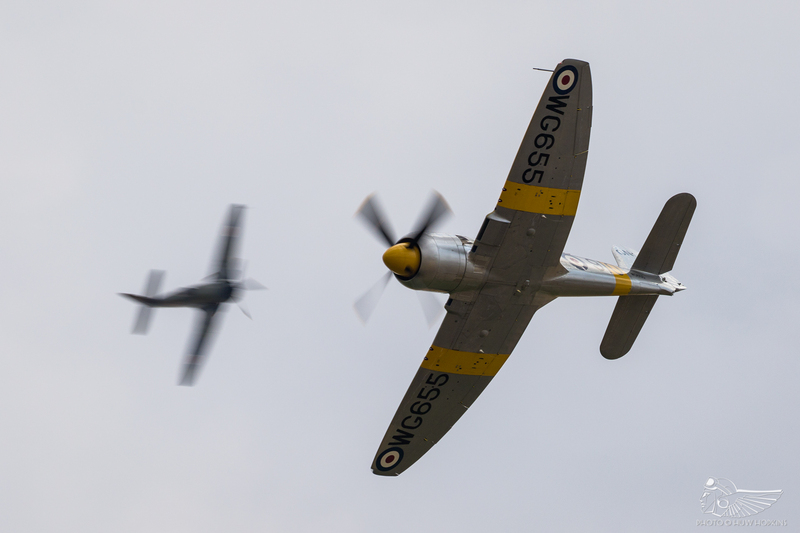 More recently, Nick Grey and Frédéric Akary revived the sequence in Furies, and this year the Fury ‘jousting’ made a welcome return with the Sea Fury T.20 and Fury ISS providing some of the most genuinely enthralling flying of the weekend. 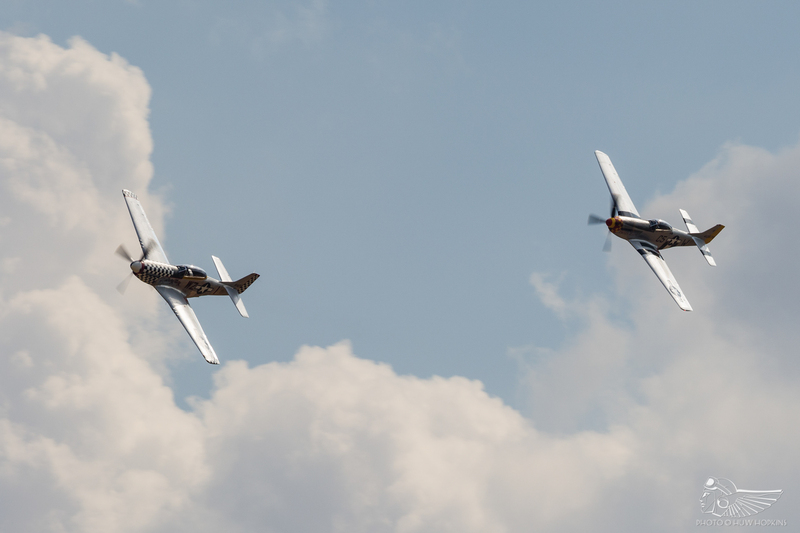 Further warbird tail chasing came courtesy of a pair of P-51 Mustangs. Dave Evans led these in restored (by Fighter Rebuilders and Pacific Fighters respectively) and repainted TF-51D Contrary Mary, formerly the somewhat drab Miss Velma and now wearing a wonderful 78th Fighter Group scheme. 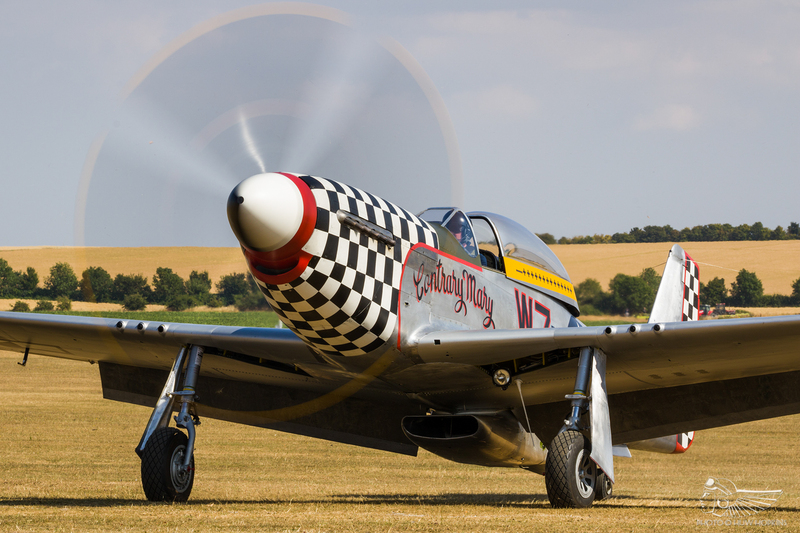 Air Leasing worked tirelessly to complete the Mustang’s restoration following its return to the UK in summer 2018, and to iron out some snags prior to the show. Their efforts were well rewarded – she was one of the stars of the show. 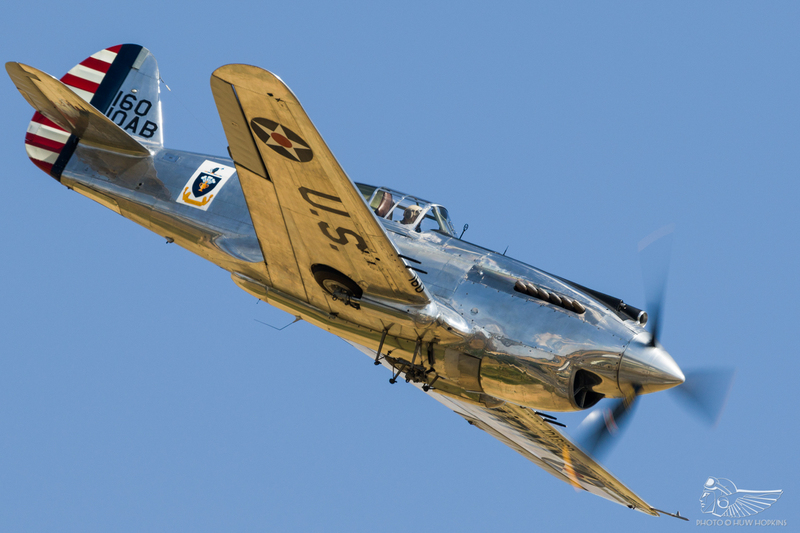 On Evans’ wing was a ‘Legends debut, the Early Birds Foundation’s P-51D Trusty Rusty. 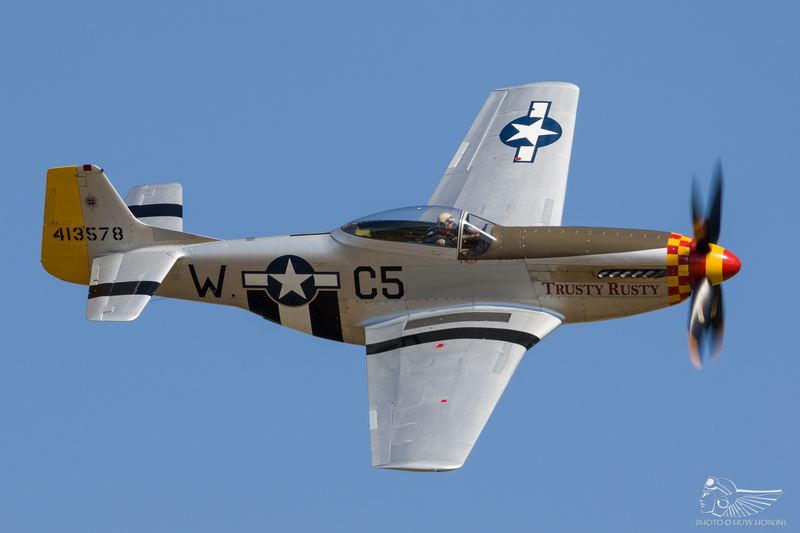 Formerly a Reno Air Race participant as Miss Ashley, this Mustang has undergone several racing modifications, including the removal of its .50cal machine guns and the fairing over of its gun ports. 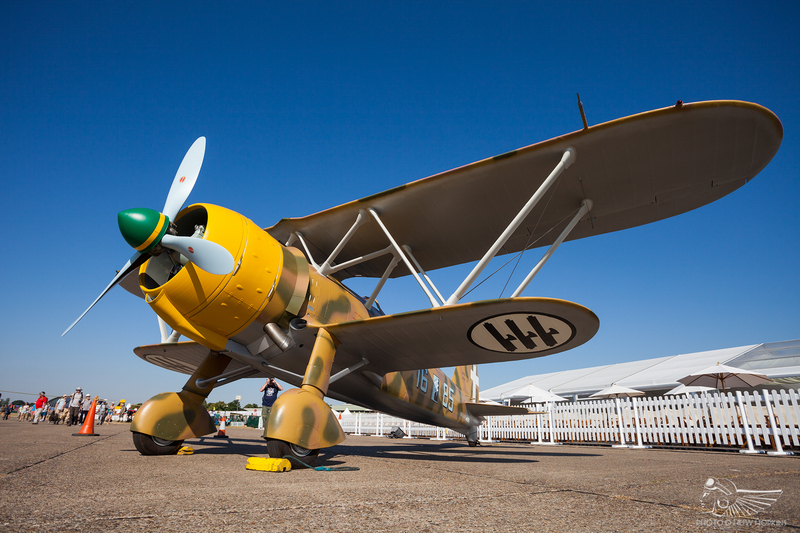 Edwin Boschoff, a sporadic visitor to ‘Legends who has previously displayed the Beech Staggerwing at the show, flew the aircraft at FL2018. Flying powerful solo aerobatics over the far side of the airfield to add depth to the sequence was the irrepressible Lars Ness in Shaun Patrick’s P-51D ‘The Shark’. 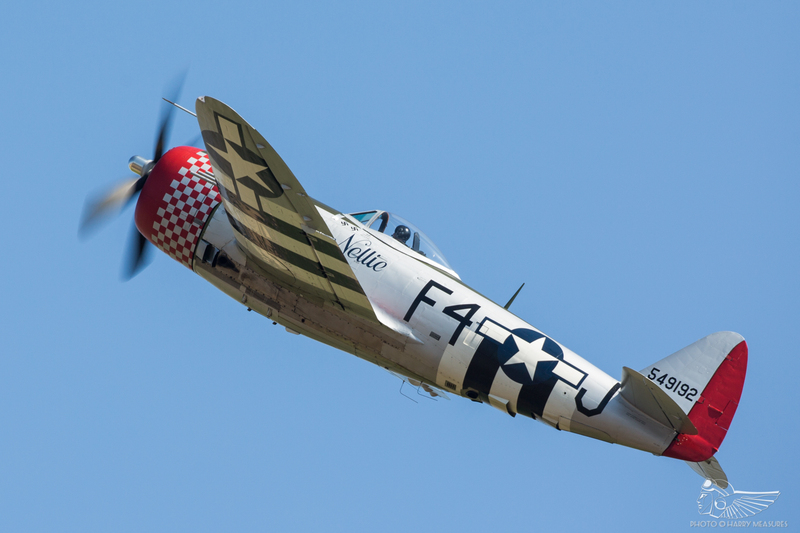 Fighter Aviation Engineering Ltd’s P-47D Thunderbolt Nellie, formerly No Guts – No Glory!, is one of the warbirds maintained and operated under the Air Leasing banner and was flown at Flying Legends by Stuart Goldspink. 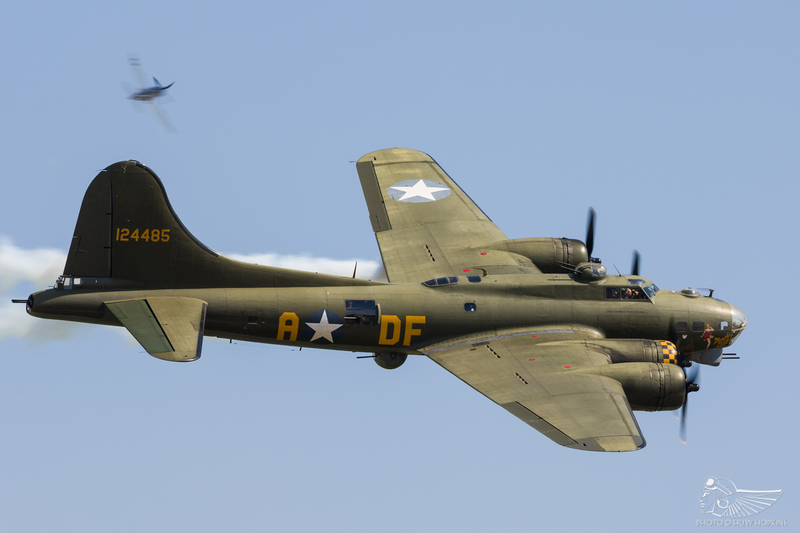 Seeing the Thunderbolt alongside B-17 Flying Fortress Sally B evoked some real nostalgia, that pairing having been a hallmark of many a ‘Legends from 1993 to 2007. 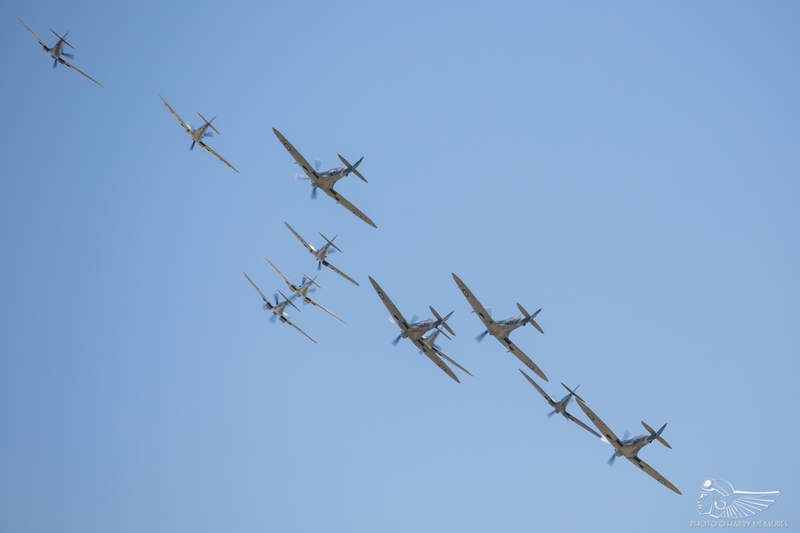 Over the years Flying Legends has staged several special formations commemorating the early days of the Second World War, dating back to 2008’s quartet of Gladiator, Hurricanes and Spitfire Mk.I. 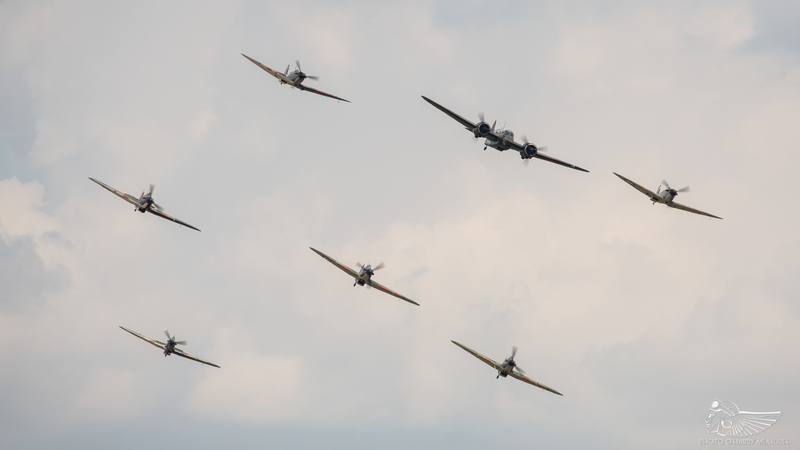 Over successive years we’ve seen the formations grow with the return to flight of more period aeroplanes, including quartets of interwar Hawker biplanes and Spitfire Mk.Is, and numerous combinations of Blenheim, Spitfires and Hurricanes, peaking with 2017’s grouping of Blenheim Mk.I, five Hurricanes and three Spitfire Mk.Is. A similarly spectacular sight was presented over FL2018 weekend; Lee Proudfoot led the gaggle once again in the Blenheim, flanked by two Spitfire Mk.Is (N3200 and X4650) with a loose box-four of Hurricanes bringing up the rear. Amongst the latter was the returning Mk.II P3351, owned by Jan Roozens and based in the south of France. 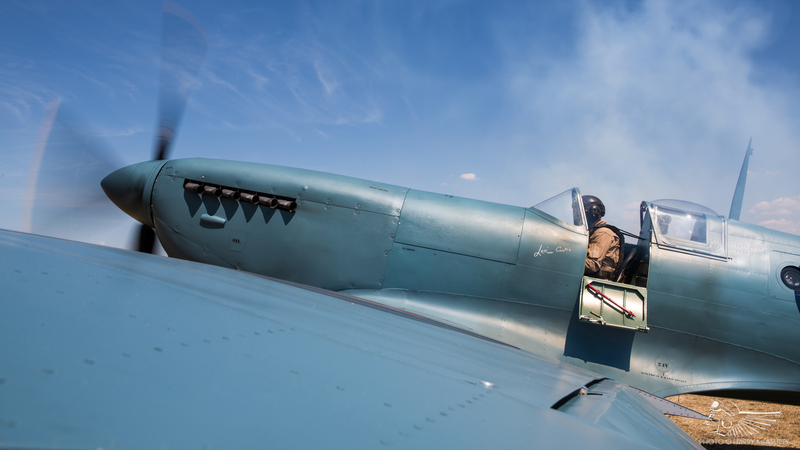 ‘Legends first-timer Bruno Ducreaux had the honour of flying the aeroplane over the weekend, carrying out high level aerobatics whilst the three British-based Hurricanes – Anglia Aircraft Restorations’ stunning P2902, the Historic Aircraft Collection’s Mk.XII No. 303 (Polish) Squadron schemed Z5140 and Hugh Taylor’s immaculate P3717 – flew a sedate tail chase below in the hands of Mark Levy, Dave Harvey and Keith Skilling respectively. The Blenheim also flew several passes with the Spitfires on each wing. How lucky we are to enjoy such sights on a yearly basis. 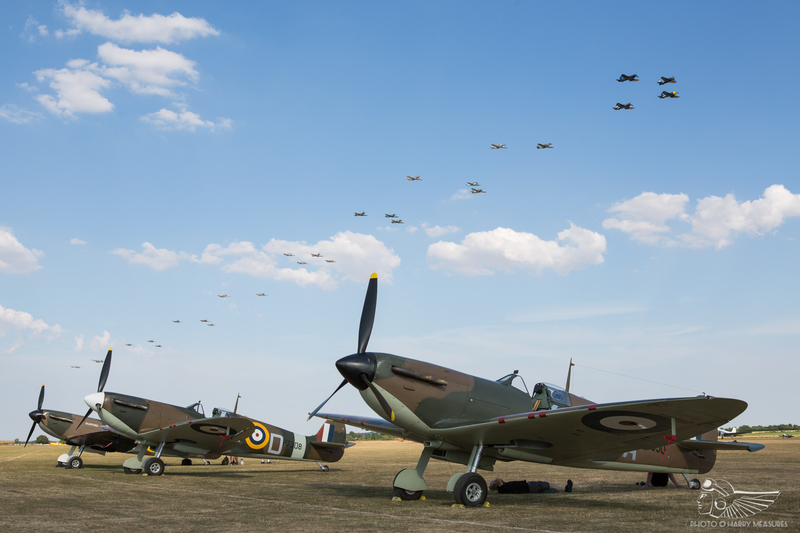 Highlight for many was the sequence marking the 50th anniversary of the filming of the Battle of Britain film, much of which took place at Duxford in 1968. 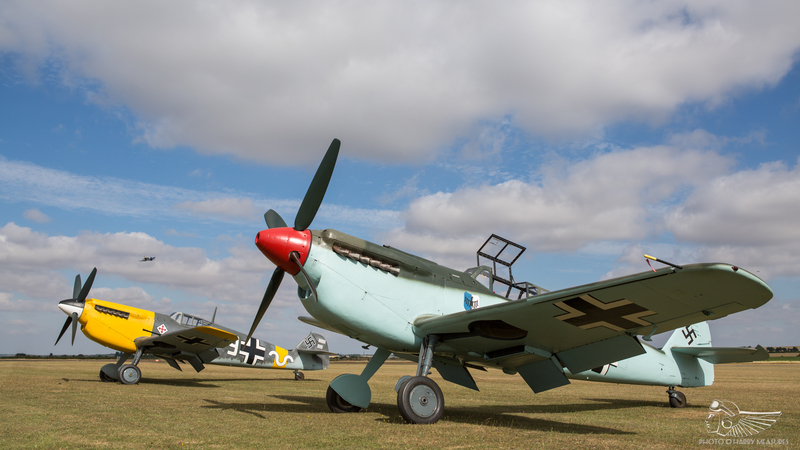 Seven surviving ‘film stars’ were gathered for the occasion with a trio of Spitfires – Mk.I AR213, Mk.V EP120 and Mk.IX MH434 – taking on four Hispano Buchóns in the set-piece many deemed to be the finest of the weekend. The 1960s saw Hamish Mahaddie and his crew sourcing British and German fighters and bombers for the film’s pivotal aerial sequences. 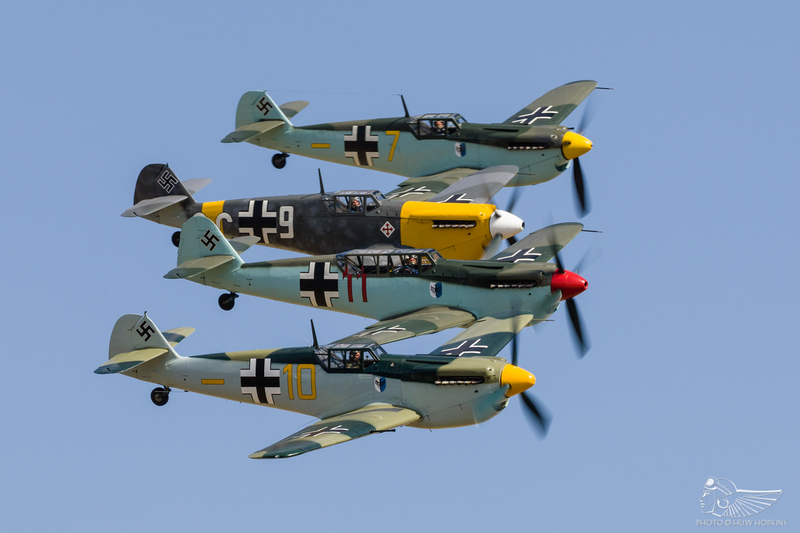 Playing the part of the Messerschmitt Bf 109Es were Spanish Hispano HA 1112-M1L Buchóns. After several years of operation in interceptor, ground attack and air combat training roles, the aeroplanes had been demobilised in the mid-1960s, many dismantled and stored in various states of disrepair at Tablada Airfield; some 27 of these were utilised for the Battle of Britain film, with 18 deemed suitable for maintenance or restoration to airworthy condition. Mahaddie acquired the lot in a sealed bid auction and Spanish engineers went about readying the aircraft for their film roles, a budget of $1,000 set for the restoration of the airworthy machines and $600 for the ground running, taxying airframes. 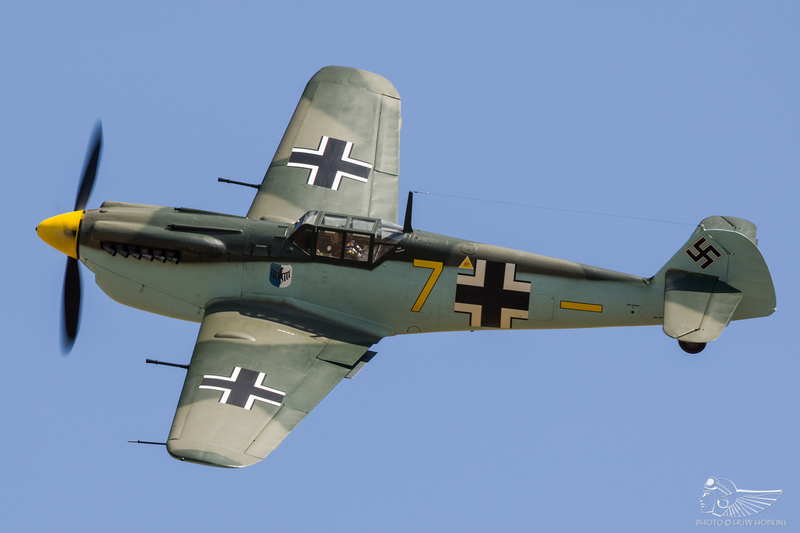 Replica machine guns were mounted in the upper cowling, struts mounted to the rear empennage and the Buchón’s elliptical wings ‘clipped’ and faired to mimmick the appearance of the Battle of Britain era Messerschmitt Bf 109Es. Chief pilot for the film’s Buchón flying, Commandante Pedro Sante Cruz, was nothing but complimentary of the ‘clipped’ Buchón’s performance. Sourcing the film’s Royal Air Force Fighter Command aeroplanes proved to be an equally lengthy process. Several airframes were identified for ground or aerial use, amongst them Air Commadore Allen Wheeler’s Spitfire Mk.Ia AR213 (G-AIST), an aeroplane stored at Old Warden and restored to flying condition for the film by ‘Tubby’ Simpson’s Aero Services at RAF Henlow. Spitfire Mk.V EP120 and Spitfire Mk.IX MH434 were also purchased for the production. Filming commenced in May 1968 with a shooting schedule spanning three months in Spain and the UK. In total, nine Spitfires, three Hurricanes, 18 Buchóns, three CASA He 111s and three Proctor ‘Stuka’ conversions were readied for the extensive aerial sequences. RAF Duxford was to play host to the production from 1 February to 31 August, and would act as the main base for the UK shooting. 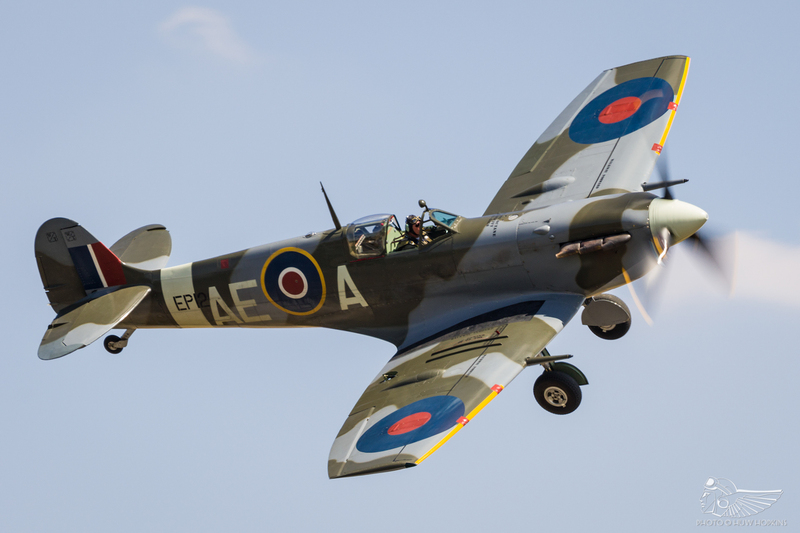 Spitfire AR213 wore seven fictional squadron codes throughout the filming, whilst EP120 depicted two fictional aeroplanes and MH434 underwent a dozen repaints into different codes. 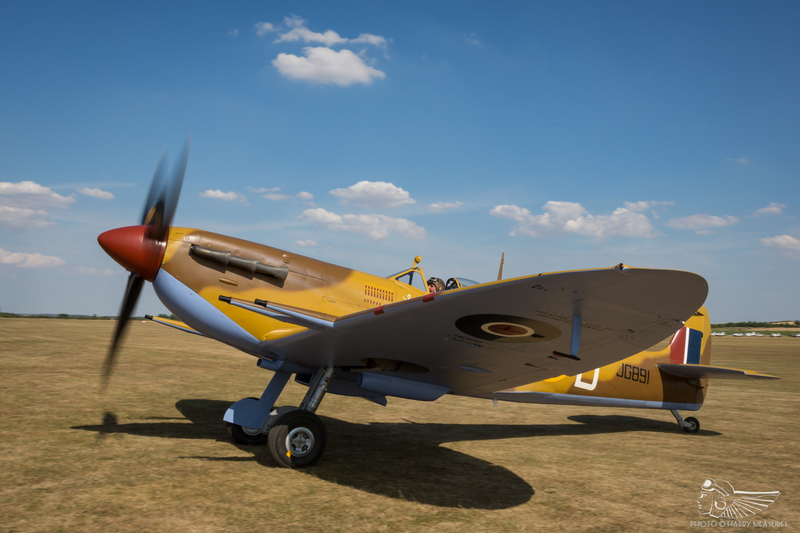 On the Buchón front, each aircraft received fictional yellow, red or white codes, with some also receiving RAF camouflage to play the part of Hurricanes during wide angle formation scenes. Duxford itself portrayed three locations in the Battle of Britain – the south-west corner became the French aerodrome so mercilessly straffed by 109s in the film’s powerful opening sequence, the main hangar base became the fighter station overseen by Kenneth Moore’s character, and the north-western area depicted the ‘South Downs Flying Club’ that Michael Caine and his squadron relocated to after the destruction of Hawkinge. Famously, the single bay Belfast Truss hangar between what we now know as Hangars 3 and 4 was destroyed by pyrotechnics during the shooting of the film’s major bombing raid sequence. 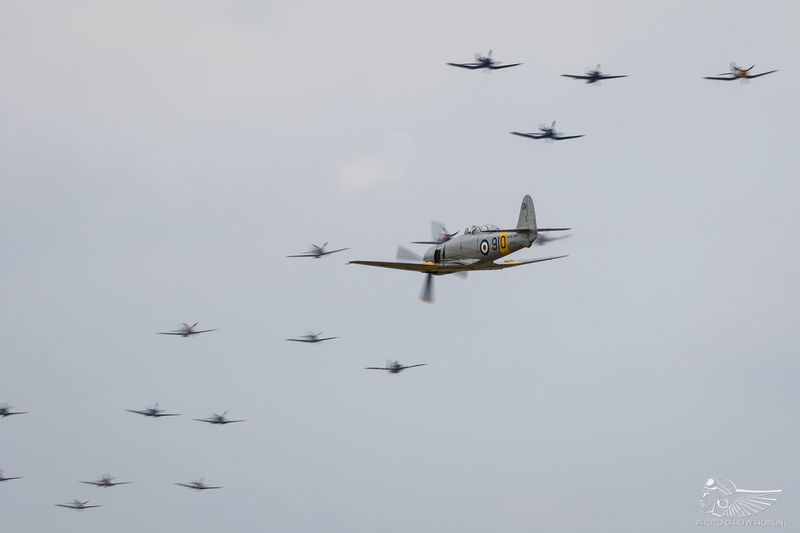 60 years on, seven of the Battle of Britain veterans gathered at Flying Legends to pay homage to the famous movie in an exciting mock dogfight. 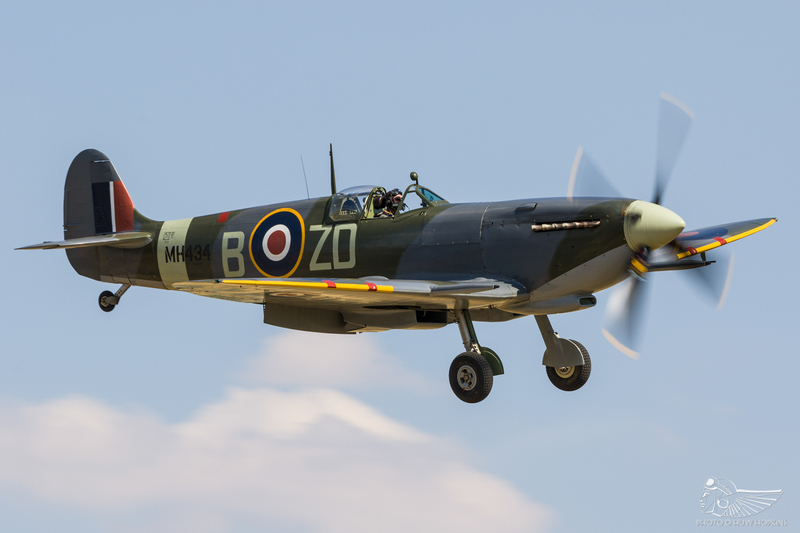 Spitfires AR213, EP120 and MH434 are now operated by Comanche Fighters, The Fighter Collection and the Old Flying Machine Company respectively, whilst the four surviving airworthy Buchóns are under the care of ARCo and Air Leasing. ARCo’s Yellow 10 has been a popular airshow performer for many years, whilst the three aeroplanes operated by Air Leasing at Sywell have all been restored to flying condition within the last 12 months following the acquisition of a cache of Battle of Britain Buchóns from Connie Edwards in Texas, USA. 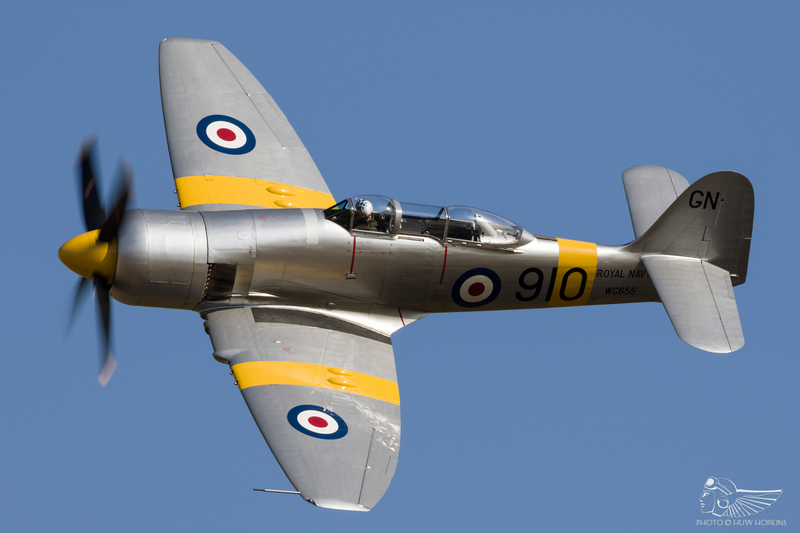 Red 11, the famous two-seater variant, was the first of these to fly last autumn, with Yellow 7 and White 9 following earlier in 2018; all three were first-timers at Flying Legends, with the latter, a four-bladed, yellow-cowled example wearing 1941-era mottled grey camouflage, making its first public airshow appearance. The four ‘Bf 109s’ began the sequence diving towards the crowd over the rolling Cambridgeshire hills, recreating the film’s opening airfield attack before splitting into pairs with Richard Grace (White 9) and Dave Puleston (Yellow 7) tangling with Spitfires AR213 (Pete Kynsey) and MH434 (Paul Bonhomme) over the grass runway whilst Lee Proudfoot (Yellow 10) and Steve Jones (Red 11) fought Brian Smith (Spitfire EP120) beyond the hard runway. This all played out to composer William Walton’s frantic Battle in the Air, creating one of those ‘only at ‘Legends’ moments that will be talked about for years to come. 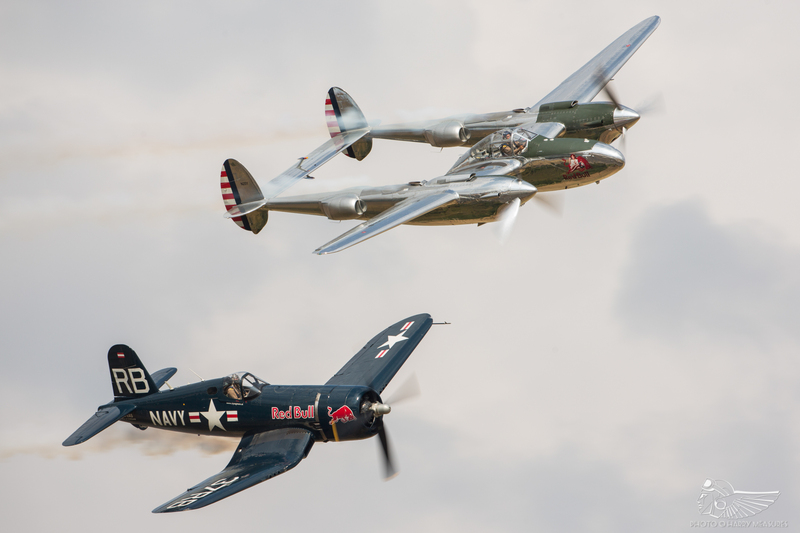 The Salzburg-based Flying Bulls arrived at Duxford en masse for the show, led for the first time in the UK by the Douglas DC-6 with the B-25 Mitchell, P-38 Lightning and F4U Corsair following. 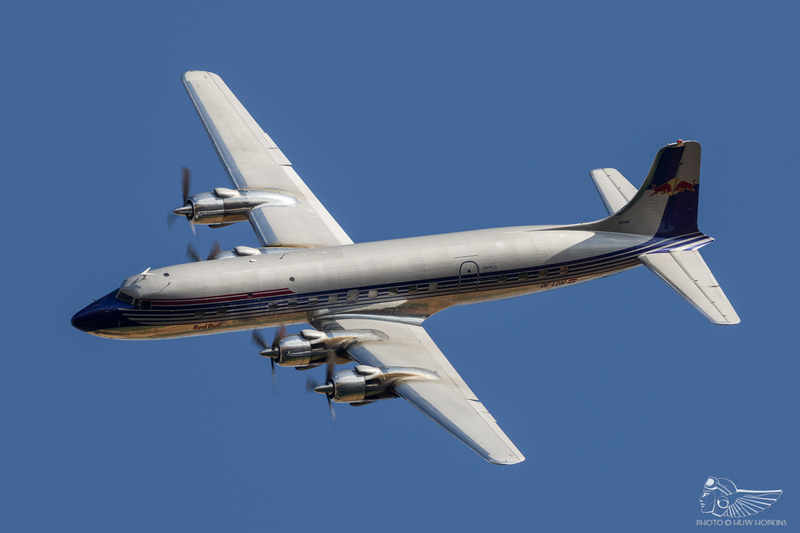 Particularly impressive was the DC-6’s Sunday solo, marked by steep wingovers and arcing topside passes that belied the aircraft’s size. 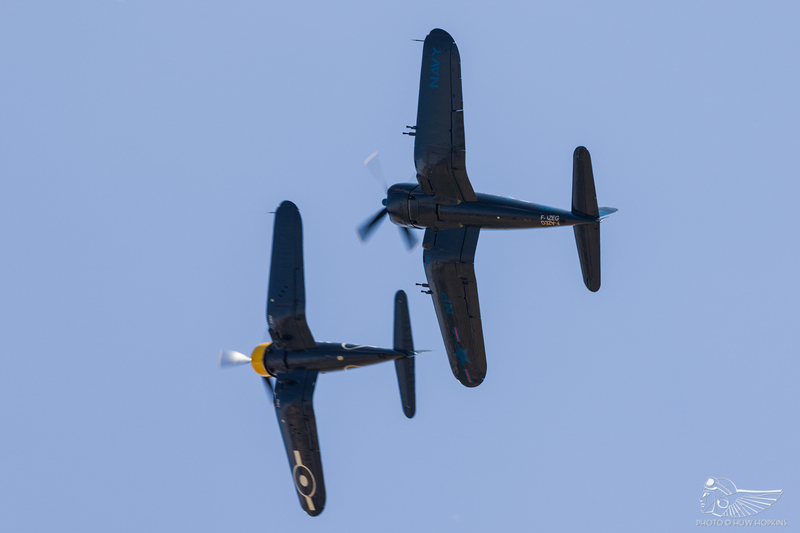 Utterly magnificent, however, were the ‘Raging Bulls’ duo of Lightning and Corsair, pilots Raimund Riedmann and Eric Goujon providing one of the best displays of recent years in their protracted close formation and tail chasing aerobatic sequence. Visiting from Switzerland were the elegant Classic Flight formation of DC-3 Dakota and three Beech-18s (one of which was a newcomer to Duxford), whilst Anna Walker provided a classic aerobatic interlude in the Bücker Jungmann. The pairing of C-53 and Grumman Wildcat was an odd one, seemingly orchestrated only in honour of the C-53’s Norwegian ownership and Wildcat pilot Rolf Meum’s Norwegian nationality. Popular amongst foreign visitors in particular was the Battle of Britain Memorial Flight’s Avro Lancaster – the awe with which spectators from Europe, the USA and beyond look upon the Lancaster is a humbling reminder of just how special this aircraft is, lest we take it for granted. Imported to the UK and repainted specially for Flying Legends was Comanche Fighters’ P-51D Mustang February. Having been reassembled and repainted at Biggin Hill, the Mustang emerged just days before FL2018 as The Hun Hunter \ Texas, the aircraft of the 355th Fighter Group’s top scoring ‘Ace’, Henry W. Brown. A second Historic Flying restoration taking flight in 2018 was Mk.V JG891, painted in distinctive No. 249 Squadron markings with desert camouflage, a red spinner and light blue underside. 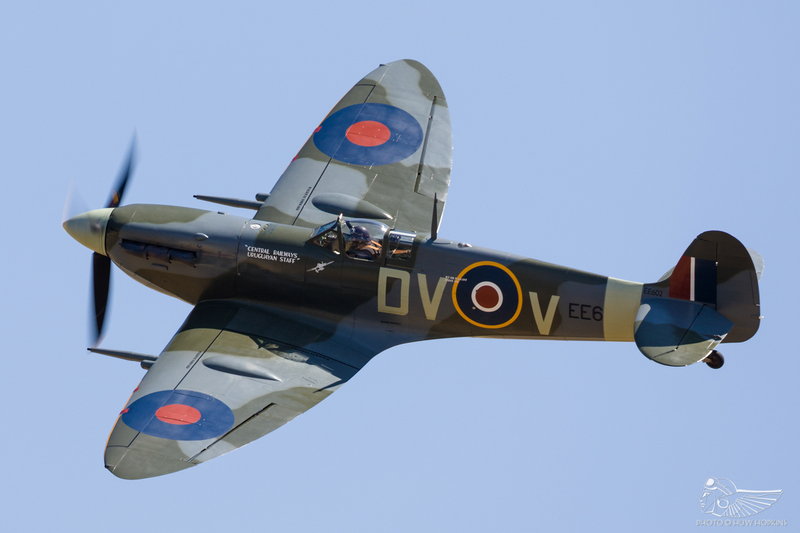 Historic aviation aficionados will recall this Spitfire flew from Duxford for the very first time in November 2006 before sale and shipment to an American owner in 2008. It is now owned by Comanche Fighters and is currently based at Duxford with ARCo as one of six Mk.Vs flying in the UK in 2018. 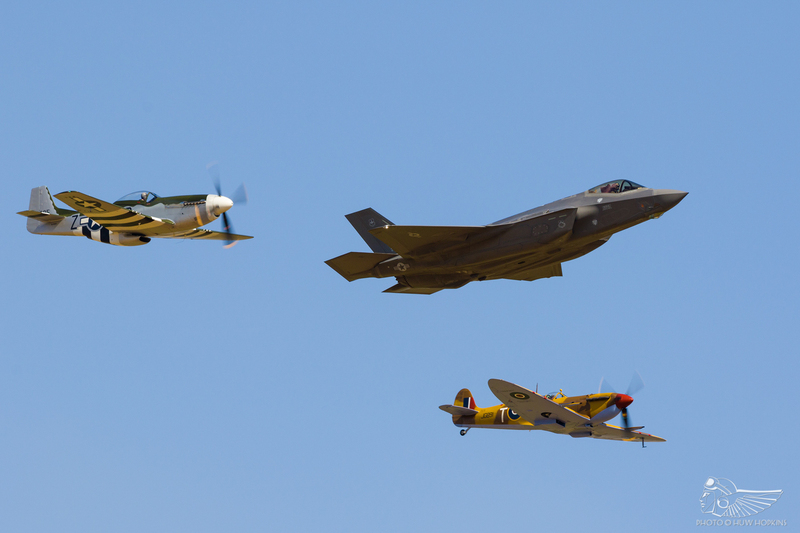 The Mustang and Spitfire (flown by Dan Friedkin and Steve Hinton respectively) joined a US Air Force Lockheed F-35A Lightning II for a moving Heritage Flight formation – though the saccharine commentary and accompanying music may grate with British enthusiasts, there’s no quarrel with the emotional resonance of the sequence. FL2018 drew towards an exhilarating conclusion with the mass take-offs for the traditional ‘Balbo’ formation. 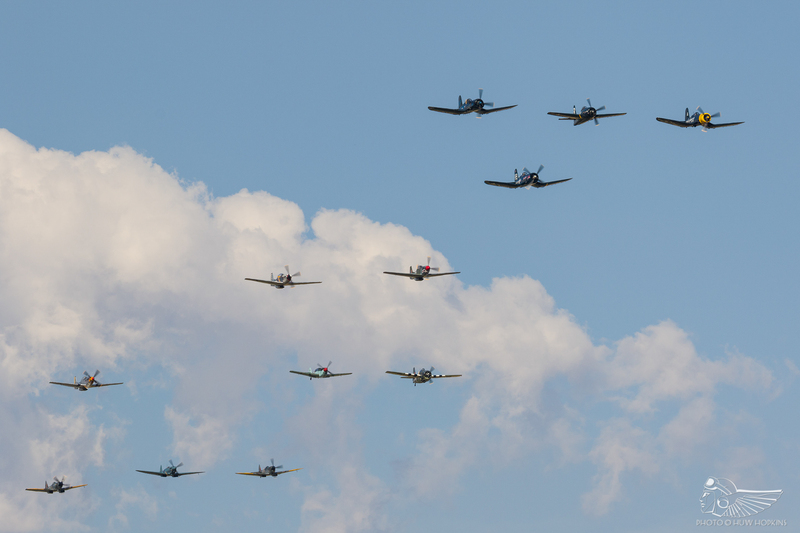 An impressive 28 aeroplanes got airborne on Saturday – the largest contingent for some years – choreographed and led by Pete Kynsey. Having seen massed warbird formations at Great Warbirds, Classic Fighter and Flying Legends itself, it would be all too easy to become blasé about the whole endeavour – but take a moment to consider the fact that you have 28 different aircraft, all with their own handling nuances, power plants and characteristics, and you appreciate the tremendous skill and effort that goes in to forming up such a large formation of disparate vintage aeroplanes. 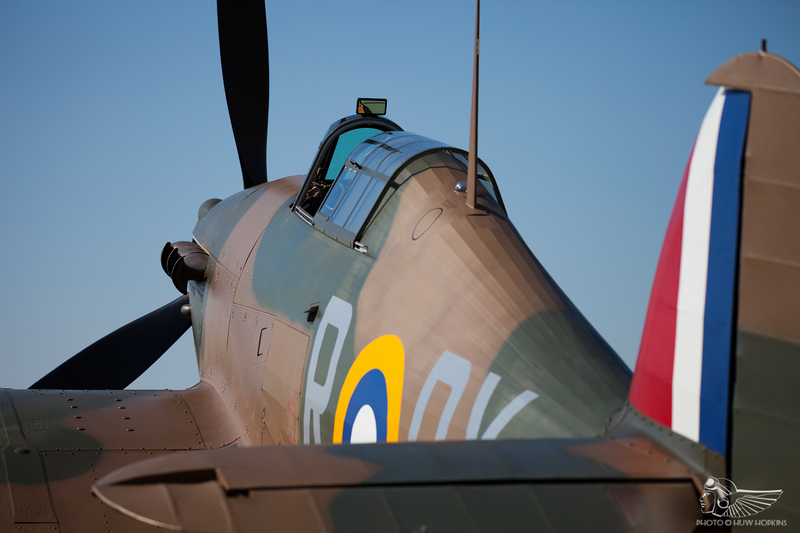 The whole thing epitomises the spirit of Flying Legends – there is no finer finale. 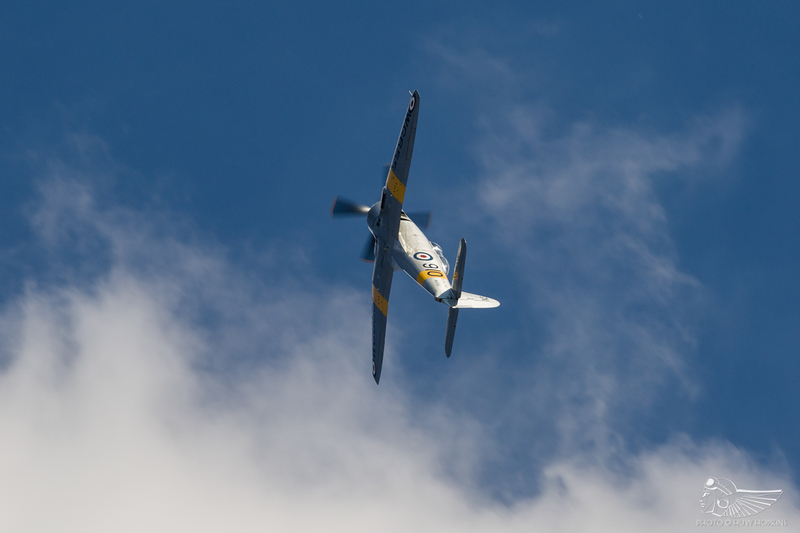 Acting as the ‘Joker’ and entertaining the crowds while the ‘Balbo’ assembles to the south was Nick Grey in TFC’s Sea Fury T.20 – by the end of Sunday’s show, Nick had flown six displays in the aircraft over the FL weekend, and nine solos over five days. It’s fair to say that the combination of man and machine works beautifully in this instance – each of his displays was positively blistering, constantly trading height for airspeed and keeping the Fury wound up and screaming throughout. And so with Nicky clearing northside, the ‘Balbo’ returned to bring the curtain down on FL2018 in spectacular fashion. 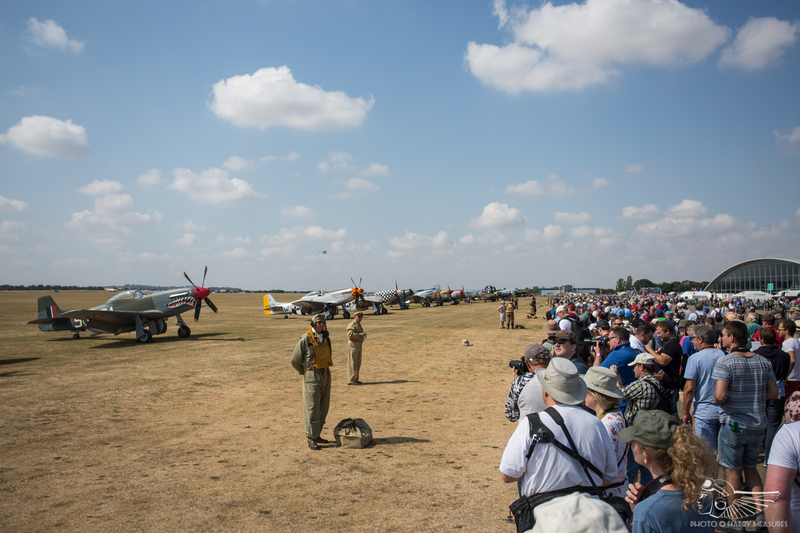 The ebb and flow of the European historic aviation scene is often reflected in Flying Legends’ participation and 2018 clearly illustrated the rapid expansion of Sywell and Duxford-based Air Leasing and Anglia Aircraft Restorations over the last 12-18 months, the companies collectively fielding ten warbirds for the event.  A further nine aeroplanes fell under the ARCo banner, with another eight coming from TFC. That we have these three large collections based (in part, at least) at Duxford is indicative of the strength of the warbird scene at current. 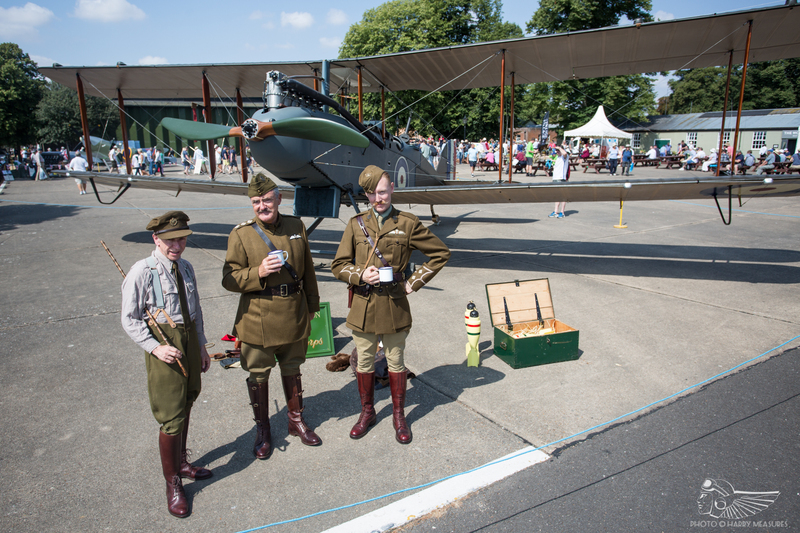 This year more than any other has seen an influx of new blood into the warbird scene – seven pilots joined the ‘Balbo’ for the first time, suggesting that the torch is being passed carefully from the long established caretakers of the vintage scene to the younger generation. 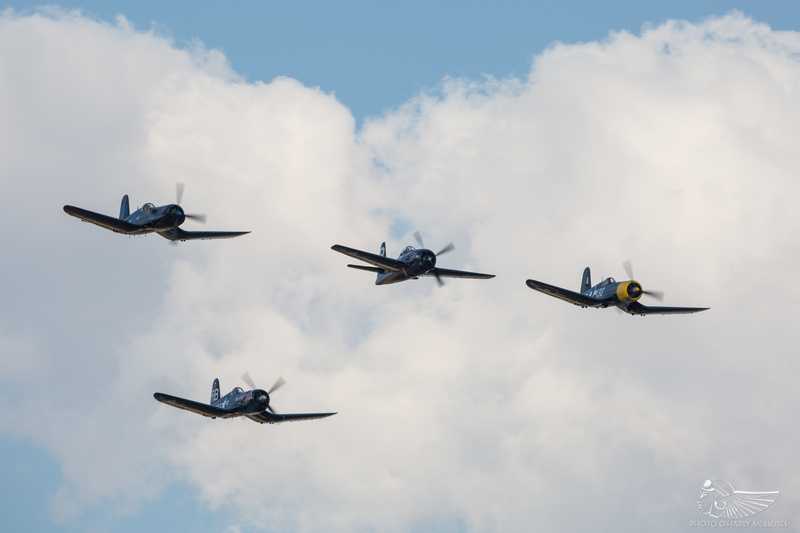 Thursday prior to FL2018 saw successive displays flown by Steve Hinton, Jr (Hawk 75), Richard Grace (P-47 Thunderbolt) and Nick Grey (Sea Fury) – three second generation aviators at their peak, producing some of the most beautiful flying you could hope to see. 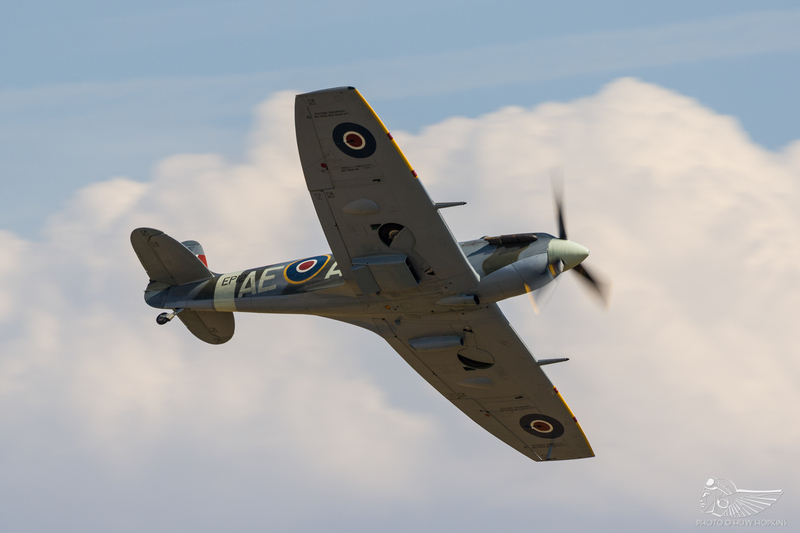 The following day, Messrs Grace and Grey were back in the air again, in the Mustang and Sea Fury this time, with ARCo’s John Romain following them in the Spitfire PRXI. 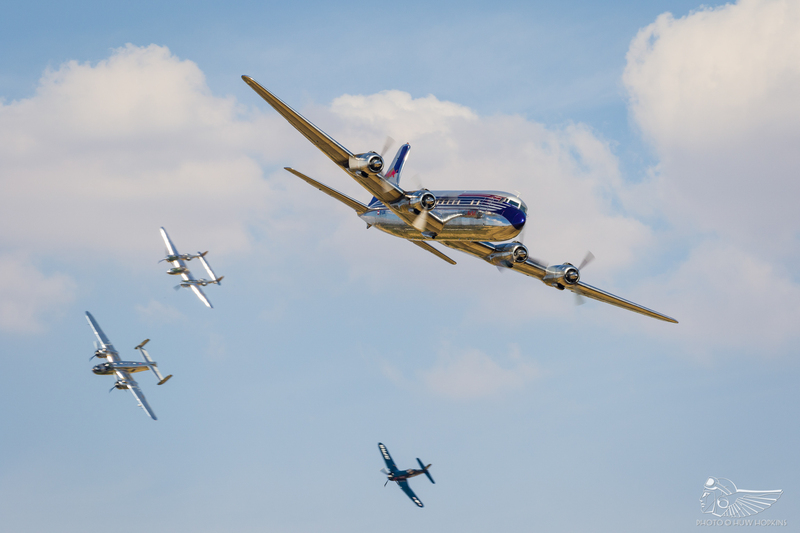 Once more we enjoyed a triple header of magnificent solo displays courtesy of three of the finest purveyors of vintage aeroplanes in the world. It’s hard not to feel quietly humbled in their presence. If the exceptional quality of flying displays at FL2018 and the wealth of debuting and returning aeroplanes are anything to go by, the future of the European historic aviation movement is in very safe hands indeed.